Carte de l'Empire d'Allemagne ou sont marquees exactement les Routes des Postes. 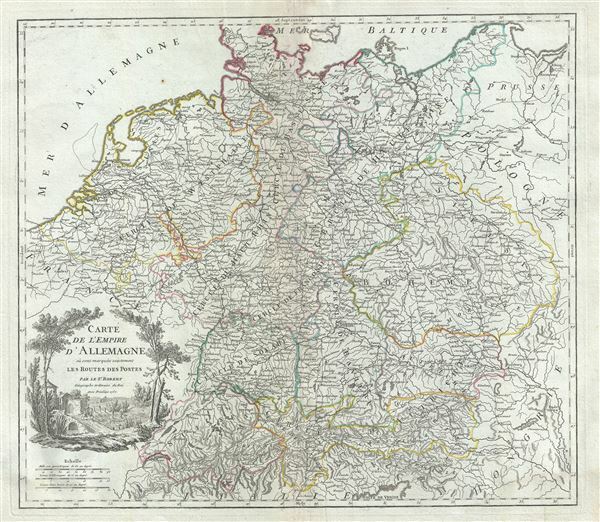 This is a scarce 1757 map of the German Empire by Robert de Vaugondy. It covers from Dunkirk in France east to Elblag in Poland and south as far as the Gulf of Venice and Geneva, to include the modern day countries of Germany, Belgium, Luxembourg, the Netherlands, Switzerland, Czech republic, Slovenia, Austria as well as parts of Italy, Poland, Hungary and Slovakia. Various postal routes are noted throughout including towns and cities along the routes. Even offers some offshore detail near Belgium and Holland. The Imperial Circles, devised by the Holy Roman Empire to administer, tax and defend the Empire (covering most of what is now Central Europe) are also identified. A beautifully engraved title cartouche adorns the top left quadrant. Issued in the 1757 issue of the Atlas Universal. The Atlas Universal was one of the first atlases based upon actual surveys. Therefore, this map is highly accurate (for the period) and has most contemporary town names correct, though historic names are, in many cases, incorrect or omitted. Very good. Minor wear and toning along original centerfold. Original platemark visible. Some spotting and offsetting. Rumsey 3353.106. Pedley, Mary Sponberg Belle et Utile: The Work of the Robert de Vaugondy Family of Mapmakers, 245.